The Planted Trees: Summary Saturday: Happy Birthday to Me! Summary Saturday: Happy Birthday to Me! This is the weekly wrap-up where I post some fun things that we did this week. 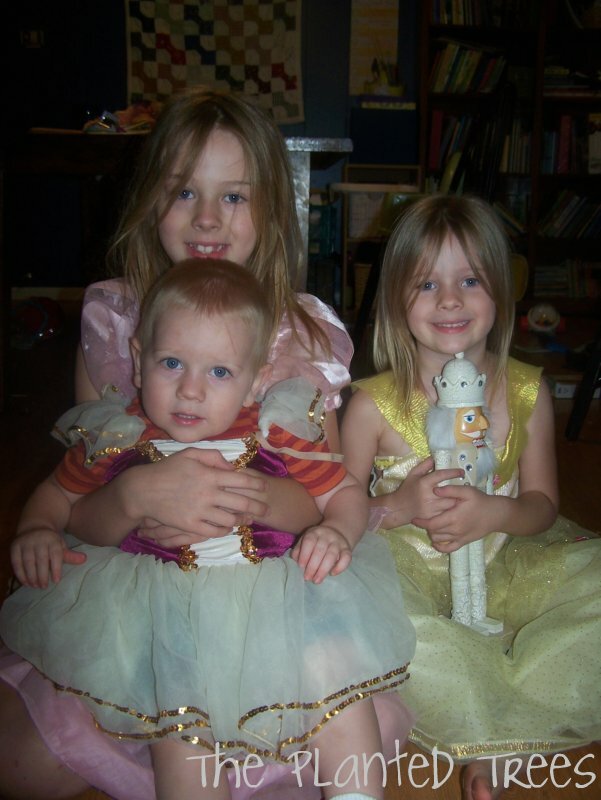 First, my birthday was this week and my kids put on a birthday Nutcracker ballet for me. Chipette played Clara (and organized the whole thing), Magpie was The Mouse King and Herr Drosselmeyer, and Monkey (poor guy) was a dancing light. It was a fabulous birthday production! Well, our dancing of the Nutcracker led to paintings of ballerinas which led to learning about the artist Edgar Degas who is famous for his paintings and sculptures of ballerinas (this process is typical of homeschool families...we are good rabbit chasers). Can you tell that Chipette has been taking ballet for 4 years? Here is Chipette's version of her own Degas ballerina picture. 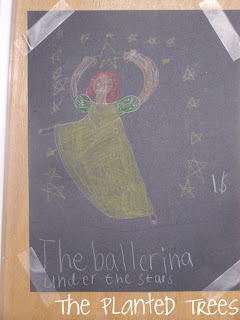 As you can see the work is titled, "The Ballerina Under the Stars" and it is for sale for $1 (as priced on the picture). Serious buyers ONLY! ﻿Up next we started a new science curriculum this week. It is Apologia's Zoology I Flying Creatures of the Fifth Day. We had our first experiment this week to show how air pressure lifts a bird's wing enabling it to fly. 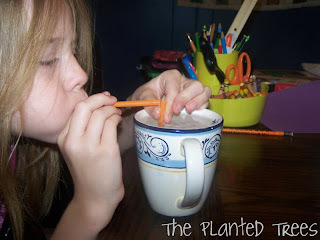 It's hard to see in the picture, but Chipette is shooting water out of the straw that is in the glass by blowing air out of the straw in her mouth causing the air pressure blowing over the straw in the glass﻿ to be less than the air pressure in the straw causing the water to shoot up the straw and out of the cup. Um. Yeah. I don't really get it either, but God did (duh, He made birds) and the Wright Brothers did (invented the airplane), so that's good enough for me. Next, we had lots of fun this week finally being able to play in the backyard again after some record setting weeks of over 100 degree temperatures. 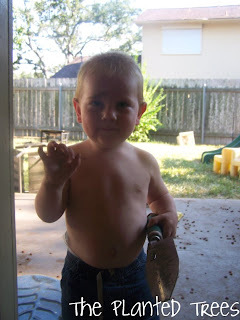 Here's Monkey very successful in helping the dog add even MORE holes to our backyard. Hope everyone else had a fun-filled week as well. The oldest boy loves Chipette's photo in front of your math board... he misses her. Oh- he wants to let her know he lost another tooth! He officially looks like a beaver. Addy is doing the same science curriculum this year! (We're starting it later this month.) It'll be nice for the girls to be able to "compare notes." @PerryFamilyChipette said that she wants to have a playdate soon with E. And to let him know that her right tooth is coming in so she's losing her beaver look! @whyamysmilesShe is really loving it and looking forward to learning about birds (which we watch all the time in our yard), insects (I didn't think girls were supposed to like bugs! ), and bats (we're going caving in Arkansas this fall, so she'll see those up close and personal!). I found a schedule online that breaks the book down into smaller pieces than a normal lesson and a list of supplementary books to go with each lesson. I also bought the lapbook that goes with Zoology 1 because Chipette loves scrapbooking and craftsy stuff as well. The lapbook and the experiments are her favorite part! I'm sick of 100 degree days also. I'm so ready for fall.